I do a lot of electrical MCC and PLC designs for wood mills and mines, and we usually always use 600V AC premium efficiency motors. My boss came up to me today and he was apparently told that he should switch out his AC fan motor for his home furnace out to DC, because the current consumption would be 1/3 with the DC motor. So my boss then comes to ask me why won't we use DC motors in an industrial setting instead of all these AC motors? I've never done motor designs for DC motors. Where is the rectifier located if you're used to having a 600V MCC? Can you get a DC motor MCC bucket? Most of all, I am trying to figure out how it's possible that the DC motor can only draw 1/3 of the HP when compared to the AC motor. Now, I was told that the DC motor and AC motor for the furnace fan in question was of the same HP. So, if that's the case, they are of the same wattage, meaning if the ac and dc voltages are the same, the current HAS to be the same. I am concerned with the current consumption on the AC side. Right now, we have MCC's that are fed from breakers in the 600V distribution center. Assuming there would be a rectifier at the individual motor bucket level, would the current consumption on the line sine of that bucket be higher or lower if a DC motor was doing the work that the existing AC motor is doing? Also, why don't we use DC motors more in industrial settings (or am I just isolated and they are in fact super common)? Are brushless pretty much the norm now for DC motors? There are a lot more to it than just switching to DC. The only reason for the possible power saving will be to let the fan run at reduced speed. As a main rule of thumb the power required for a fan is proportional to the speed to the power of three. So in order to reduce the power to a third, the speed shall be reduced by around 30% to near 70% of the original speed. That can just as easily (and cheaply) be done by installing a slower (and smaller) motor, or by installing some AC drives. Remember, the standard induction motors have long been preferred because of their simplicity, and minimal maintenance requirements. No brushes and the like, that wears out over time as in DC motors. Installing DC motors in any industrial application is (were) only done if there are very special requirements to starting torque or speed control. It is definitely not quite as simple as just changing some MCC drawer. There is no why a DC motor will draw less power than your standard induction motor for the same application. I presume this is a HVAC application and the fan is either running constantly or off, i.e. no speed control; the motor driving the fan load is probably the PSC type, i.e. single speed. Starting and stopping an AC motor inrush current versus energy consumption for operating continuously, air quality, dust filtration and poor heat distribution are areas of concern with the current fan that is used. By reference to DC motor, I presume you mean an ECM motor. These are usually quieter and offering speed control No surprise these are more expensive to buy; on a low end furnace you may question whether it is worth the expense. The variable speed buys you comfort, with better temperature control (as the speed regulates according to the thermostat). It can also save you a lot of money on energy consumption, but by how much depends on usage. Additionally, ECM motors are usually more efficient than a PSC motors. Finally, check what design changes are required to adapt to an ECM motor. I think this is major topic and before I have read interesting article about experiment to compare power consumption between AC motor fan and DC motor fan. In general, it is true that DC motor is lower current consumption than AC motor. But it is possible to make more detail control for DC motor. Especially DC brushless motor can control well by sensor and microcontroller. As a result, it can give current only when change the magnet direction. (AC motor have to give current constantly due to their characteristic...) So current consumption is saved. But I think DC motor can not be used a lot for industrial setting instead of AC motor. Because now control for AC motor is also improving. Off course it is not necessary to parepare rectifier circuit to drive it. Probably now we can introduce reasonable AC drive for economize running costs. It's interesting to note that most of the DC tube axial fans used in electronic products today actually contain a small AC inverter. Albeit, at much higher frequency than 50 or 60 Hz. Possibly the idea of reduced "power draw" comes from the AC motor's power factor rating. That is the voltage and current sine waves not being exactly in phase. Power Factor or P.F. being the ratio of apparent power to true power. I have never heard of an AC fan motor with a power factor of 0.33 and would be very interested to learn where that data was obtained. If the motor was a small size, DC may be an option but they are rare for industrial motors, these days a VFD with an AC motor is the preferred and most cost effective method of controlling speed. The mention of current only makes me wonder what the effective DC voltage would be. I am assuming the AC fan motor for the home furnace is single phase. Three phase motors would be a different issue and if working with 690V and converting to DC, you would get significant issues with the equipment to control this unless you used a rectifier to directly connect to the motor and use the firing of the SCRs to control the DC voltage. DC motors may have specialized applications but for the larger motors, a very complex, expensive and I expect a more intensive maintenance requirement. Design of motor is done based upon its torque and load. I don't think so that industrial motor can be run on DC current as even the small electronics motor which are fed through DC battery source etc are operated through rectifier inbuilt in the motor which change current from DC to AC .All these are related with magnetic flux which are easily generated through AC current and these magnetic flux gives the torque to rotate the rotor of the motor.If through DC, it is possible then it okay but it should be cost effective as well as less maintenance cost and certainly should compliance of safety regulation. Three-phase motors are already pretty efficient so that is why they are dominant in industry. If you need variability due to load conditions then a variable frequency drive is the best solution as others have mentioned due to reduced maintenance that DC motor require. Some places (power plants for one) have large DC systems and motors to allow for black start operation of critical loads, but it is only out of these need, not for efficiency that they go this route. Single-phase AC motors are not very efficient, and changing out to a DC motor might make sense in some cases, but you have to add a rectifier which has loses and you still have to deal with maintenance. There are devices that you can add to single-phase AC motors to help smooth out the power consumption, but be wary as many of these are fake (and they definitely don't help three-phase motors). I guess the first question I have is size. If we are talking about 20 hp, that's one thing. If we are discussing 1000 hp, that's a whole different world. Keep in mind that a D.C. Drive will be a 3 phase full wave bridge and likely a 6 pulse drive. Efficiency goes down the pipe unless you are running at full speed, then why have a variable speed drive. 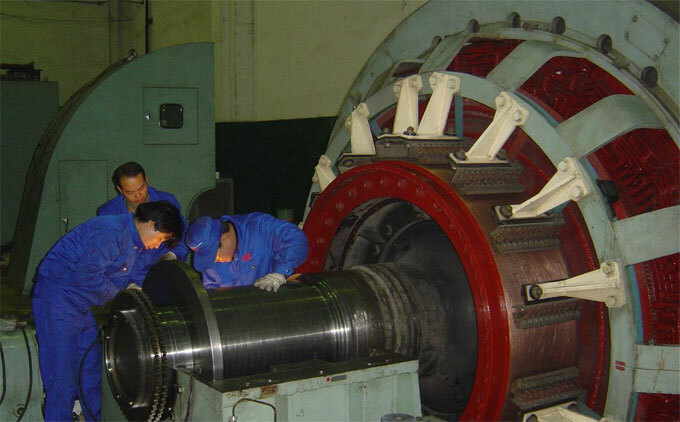 If plant personnel performing maintenance only are familiar with 3 phase AC motors, some training will be necessary. Brush maintenance is a bit of an art form. The next thing to consider is harmonic distortion. If these are big motors, that might be an issue. 12 and 18 pulse drives can fix this, but the price / benefit might be an issue. Special transformers and special drives. If this is all about saving energy, there may be far better approaches. That starts with an energy audit.